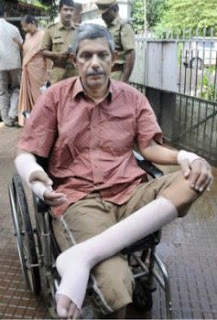 The story goes like this: a lecturer whose right hand was chopped off by radicals sometimes back (accusing him of setting a question paper with a derogatory reference to their religion) had the shock of his life when he has been removed from service by college authorities. However, the website of Newman private Catholic college at Thodupuzha (where the lecturer worked and was kicked-off) carries the following message in its homepage. Hello my dear administration headed by the diocese of Kothamangalam .I am confused now - shall I curse the fundamentalist or the Holy .... who run the college. You beg the people to donate but you are not able to give him a job. What an irony.